After making several changes for the mid-week cup win over Villa, Saints reverted to the starting line-up from Anfield a week ago. Bournemouth's Artur Boruc had not trained this week and was replaced by Federici. In midfield, Harry Arter was starting his first Premier League game after injury. A minute of silence for All Saints Day was impeccably observed by everyone – apart from the local seagulls. Saints were kicking towards the Northam and Bournemouth were in their changed kit of black and blue. The first exchanges were tentative as the sides felt their way into the match. Saints threatened down the left on 5 minutes with Victor and Mané combining but the final ball was easily cleared. A minute later Cédric made the first of many forays down his wing, but the cross was overhit. Then Clasie fed Pellè. The Italian got his shot off but it was blocked for a corner. Federici punched Tadić’s cross clear, but Saints recovered the ball and kept Bournemouth penned back. A left sided attack then saw Bertie chase down a ball which just ran out of play. Early signs were good. Bournemouth mounted their first attack on 10 mins but Virgil made a splendid block. They recovered the ball but a silly foul on Mané relieved the pressure. Then Tadić moved purposefully down the right. His pass found Mané whose strike deflected off a defender for a corner. Davis’ corner was cleared, but the attempted Bournemouth break was quickly thwarted. In the first 15 minutes, Saints had enjoyed 64% possession. Mane showed great skill forcing the keeper to punch the ball away. Saints recovered the ball, crossed to Pellè whose knock-down gave Mané another shooting chance which he blazed wide. The Cherries then enjoyed a spell of possession but the ball went sideways, not forwards. Mané recovered possession and found Tadić but his cross flew behind the team-mates rushing into the box. On 20 mins a foul gave Tadić another dead-ball opportunity but the defence headed it away. Then Bournemouth broke through Smith on the right. The full-backs’ run was ended abruptly by Wanyama’s clumsy challenge. The Kenyan was booked but the visitors’ free-kick routine went horribly wrong and Mané came away with the ball. On 25m another Tadić cross hit a defender and gained another corner. Davis swung it in and the ball bounced to Clasie whose shot was on target but charged down. Two minutes later another cross from Tadić sailed over Pellè who’d come short. Then Cédric played in Mané who tried to head the ball over Federici. The keeper punched the ball and his defence cleared the danger. With the half hour approaching Bournemouth were just about coping but had worked very hard. They tried to get their passing game going, but when they next lost possession, Saints scored. Clasie picked up the ball on the left and played a sweet pass to Pellè. The Italian’s deft flick saw Bertie breaking beyond the defence; he struck a fabulous square ball to the back stick where “goal machine” Steve Davis hit a fine volley in off the keeper: 1-0 Saints. Bournemouth pressed forward, but Murray lost out in a foot-race with Virgil and looked pretty annoyed about it. Within 5 minutes, Saints extended their lead. The ball was fed to Mané who looped an audacious long pass to Tadić on the left touchline. The Serb dragged his marker to the goal-line, before curling a peach of a cross into the box. Pellè rose above Distin and bulleted his header past the keeper: 2-0. Saints then dominated the game with good possession and further scoring chances. It was good to watch but brought no more goals. Then, with 1 minute added time, Bournemouth created a good chance. Dan Gosling fed Murray but the big striker was again thwarted by the attention of Virgil. His block saw the ball balloon into the air. Gosling, running in, headed it just wide. Half time – 2-0. Eddie Howe must have worked wonders during the interval. He made 2 changes bringing on King and Stanislas for Murray and Pugh. Saints replaced Fonte (apparently injured) with Yoshida. Bournemouth were a different proposition from hereon. Their movement was better and they showed much more attacking ambition. On 47m Gosling fired over, then Smith’s cross sailed too far but the away team were at last competing. They enjoyed good possession and Stanislas and Ritchie had shots blocked. Stekelenburg had yet to be tested, but his defence were sitting much deeper now. Bournemouth frequently let us off the hook with overhit passes or silly fouls, like that by Francis on Tadić after 57m which saw the Cherries captain booked. 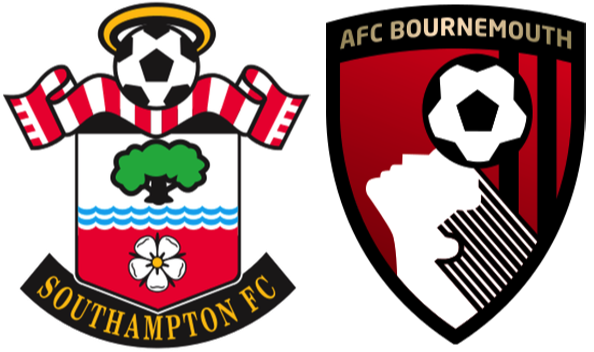 With 60 minutes gone, Bournemouth continued to dominate play without seriously troubling Saints. A minute later the home side broke down field but Tadić blazed wide. Frustration probably got the better of Ritchie on 64m when he clattered Clasie and was booked. A mazy run by Arter was ended when Virgil brought him down. The kick was in a decent position but Stanislas curled his shot just wide. Then Ritchie and Arter combined to earn a corner on the right. A short corner led to the ball being driven low across the box but no-one laid a boot on it as it rolled to safety. Bournemouth’s next attack saw Arter shoot wide. On 71 minutes Clasie was replaced by Romeu but Bournemouth continued to press. Stanislas’s attempted bicycle kick barely got off the ground. On 73 minutes Tomlin replaced Arter. A rare Saints attack ended with Wanyama’s weak shot rolling wide. A foul on Tadić then gave Saints another chance but Pellè and Mané conspired to put the ball beyond Bertie. Tomlin’s direct running gave Bournemouth something different and on 78m he was upended by Victor. Mr Pawson produced another yellow, closely followed by a red card. Saints were down to 10 men. Stanislas tried another shot which hit the wall and went out for a corner. Ronald then withdrew Tadić, bringing on JWP to sit alongside Romeu. The birthday boy was particularly effective in that role. Bournemouth piled on the pressure but a string of corners brought no rewards. Ritchie shot every chance he got but never troubled Stekelenburg. After another shot soared into the Northam, Sky’s cameras focused on Ronald who was “doing his nut” in the technical area. On 87 minutes Stekelenburg was forced to save at his near post when Tomlin cut in from the left. A minute later the big Dutchman was obliged to smother a shot from King. Another Saints break then saw Cédric overhit his cross. JWP was covering well at the back and Saints were still forcing the Cherries to shoot from distance. As 90m came up, Stanislas blazed another effort over the top. Bournemouth pressed throughout 4 added minutes but could only muster a header wide by Smith. Time was up: 2-0 Saints. I quite like Bournemouth. They play nice football and I’d like to see them stay up. It may have been different had injuries not depleted their squad but, if they are going to stay in this league, Eddie Howe needs to get a pacey striker on-board PDQ. From a Saints perspective, this performance was much like the Leicester match. If the Cherries had players of the quality of Mahrez and Vardy, the result may have been similar. MoM: Pelle – everyone says so; who am I to argue?